Welcome to Day #4 of Kick Off to Summer Week, a multi-blogger event co-host by Lauren of From Gate to Plate and Summer of Summer Scraps. With summer quickly approaching and Memorial Day in a few weeks, we wanted to make sure you had plenty of ideas for your Memorial Day activities. Each day we will be serving up a variety of different appetizers, main dishes, desserts, decor, printables and more all centered around the up-coming Memorial Day. We hope you enjoy all of these wonderful ideas. Tune in each day starting with Monday, May 12 and ending on Saturday, May 17. We have great prizes up for grabs throughout the week so you will not want to miss out on any of the days! Follow #KickOffToSummerWeek2014 on Twitter to keep up to date with all of our spectacular ideas and giveaways! Summer is all about salads. I stick to the green kind because for the most part pasta salads, egg salads, and potato salads all have loads of mayo. I just cannot do mayo. When I studied abroad in Paris I told my host mother there were two things I just couldn't do: mayo and peas. The mayo was the one that threw her for a loop. The French like their mayo. She couldn't figure out how I ate sandwiches for lunch since it was customary to put mayo, large quantities at that, on every sandwich. Lucky for me they didn't do mayo on paninis. I had a panini almost every day in Paris. OK back to the topic at hand. My husband likes potato salad and he gets bored with my green salads after a few nights in a row so we needed a compromise. This potato salad is our compromise. 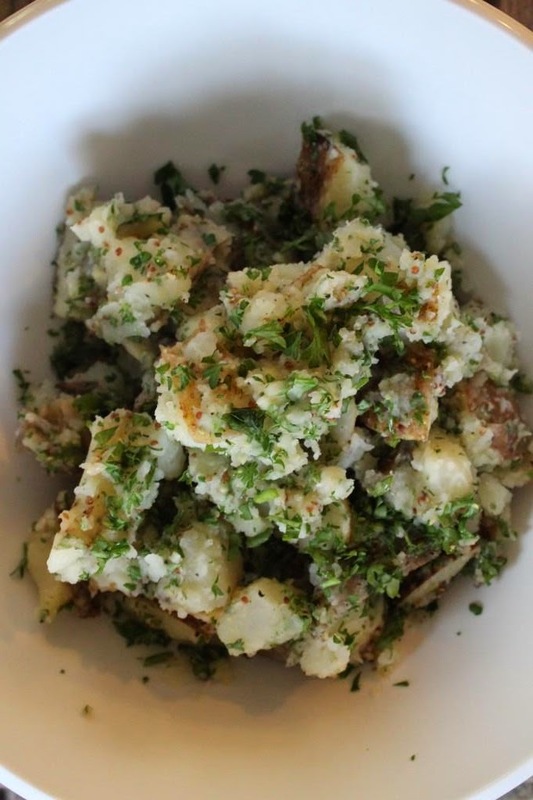 The cooked potatoes are tossed in a cider mustard vinaigrette and topped with parsley. I like the potato salad warm. The vinegar flavor is a bit more potent warm. It is also good cold; the flavors soak into the potatoes which minimizes the vinegar taste but also spreads all of the flavors through the potatoes. No mayo also means you can have this potato salad unrefrigerated without worries. Picnic anyone? Place the potatoes in a large sauce pan. Add water to cover the potatoes and bring to a boil on high heat. Add one teaspoon of salt to water. Reduce heat to medium and simmer for 20-30 minutes until potatoes are tender. Drain and cool slightly. Whisk together olive oil, vinegar, sugar, and mustard in a small bowl. Adjust seasoning to taste. Stir in 1/2 of the parsley bunch and green onions. Toss the potatoes with the dressing. It is OK to slightly mash and break up the potatoes in this process. Garnish with remaining parsley and green onions. Serve warm. Today's sponsor for Day 4 of Kick Off to Summer Week belongs to World Market. World Market has everything! From furniture, accessories, food and drink; everything you need for entertaining! They have beautiful multicultural pieces that are so unique and stylish (from over 50 countries!). Work Market has something for every room, every theme, every occasion, and every season - and let me tell you their Gourmet Goodies are fabulous! I seriously wish I could win this fabulous prize! Did you know you can follow World Market on Facebook, Pinterest, and Twitter? Yup, now you do :). We are giving away a $100 World Market Gift card to ONE of our lucky readers. Get excited because it just might be you!